All articles cited below are available in PDF format from this website. Here's a handy guide to help make smarter choices for all personal care products. 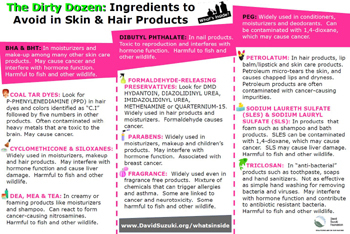 These are the top ingredients that are toxic to almost everything on the face of the earth. The Dirty Dozen ingredient guide is available to download here. Click on the image to download and view the article. A New Yorker Magazine article about expensive face creams concludes that no face cream reduces wrinkles, period. Even the researchers who invented these concoctions admit to the lack of efficacy. Price is only about exotic ingredients rather than effectiveness. The best way to minimize the signs of aging is to make healthy lifestyle choices. Let's face it (sic), the only cure for aging is death. Click on the photo to download and view the article. Guess what? That anti-bacteria gel that you use on your hands doesn't do much at all to remove germs. Even the government scientists know this, which is why we see the recent 'wash your hands' campaign plastered in most public restrooms.